By now, you've probably stopped freaking out about Prince guest-starring on New Girl but just wait until you hear how he got cast. Apparently, Prince is just like you — well, kind of — and he's a television relationship 'shipper in his spare time. (You know, when he's not being a multi-platinum artist who plays multiple instruments and is otherwise the most mystical man on the planet.) According E! Online Prince is a HUGE fan of New Girl — so huge, in fact, that he more or less turned into a stalker trying to get himself on the show — and that's how he nabbed his guest-starring role this season. Oh, and by the way, he loves Nick and Jess. He contacted us last season because he's a huge fan. He knows everything about the show. He contacted Zooey [Deschanel] and Hannah [Simone] directly and asked to do the show. We couldn't work it out last year. But when the Super Bowl thing was floated, it was perfect timing. 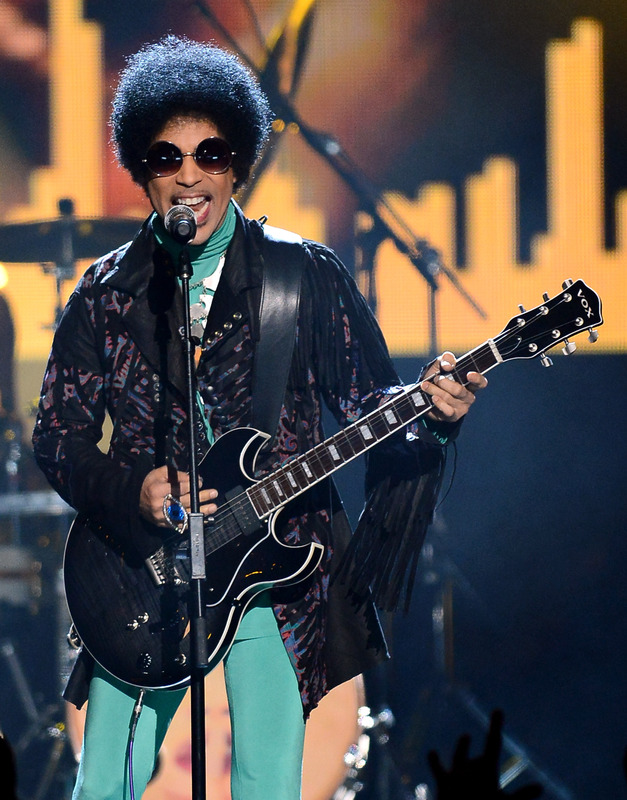 First of all, Prince has Zooey Deschanel's phone number — WHAT? And now that that's out of the way, Prince contacted not one, but two people about getting onto this show. He must seriously love New Girl. Like, really, really love it. And even more than that —when he pitched himself for the show, he had an exact role in mind. So clearly, he spent a lot of time thinking about how he'd best fit New Girl's needs as a guest star. (That's some serious diligence and persistence.) Prince apparently told executive producer Dave Finkel, "I want to be involved in the show in a real way and I want to help Nick and Jess with their relationship," and that's exactly what he'll be doing via "hip tips". Whatever "hip tips" are, we can only wonder — but in the episode, which will air on Feb. 2, Prince will get Jess to try to "bring out this inner part of her that hadn't been brought to the forefront" by using the aforementioned "hip tips". Well good luck to you, Prince. If these "hip tips" really work, Prince might have just invented a new career for himself (not that he needs one). We're also in a for a real treat because Prince is great at comedy. Finkel revealed that the musician is actually incredibly funny with his "very quiet, wry sense of humor" and that he has crazy comic instincts. You're shocked, I know you are but you also probably feel really great because Prince's guest-starring role is going to be SO much better than that awkward time Taylor Swift guest-starred. Baer added that Prince is well aware that the value in his persona is doing little to nothing and being as subtle as possible — which translated to him being very conscious in supporting Deschanel and co-star Jake Johnson on camera. Even Deschanel opened up about working with Prince on the red carpet of the Golden Globes this weekend, where she sang his praises and admitted that she felt a little put to shame by his talent. So basically — Prince loves New Girl, he loves Nick and Jess, and he's the world's best guest star. Who would've thought? But there's an even bigger story here — New Girl execs wanted to cast Emily Deschanel in the show. Yes, Zooey Deschanel's real life sister. They've already announced that Linda Cardellini will play Jess' sister in upcoming episodes, but imagine a world where Zooey and Emily played sisters on screen? It would be a dream come true — but we'd settle for Emily in any old guest-starring if it meant getting her on the show. According to Baer, Zooey and the show's execs would love to work with the Bones star. So here's hoping for a very Deschanel and Prince-filled 2014 on New Girl.